Last Epoch is turning out to be an impressive action-RPG with good Linux support, with a developer I've been impressed with and a huge new feature-filled build is out. Originally funded on Kickstarter, Eleventh Hour Games managed to do rather well with over $250K pledged! Note: My copy was provided by the developer. As a reminder, it's currently in Alpha and it's not even available on Steam or any other store but their own website until it's further developed. What's already in is great and this expansive update covers quite a lot of the game. Thankfully, it mostly solves a big issue I had with the last version, with the mini-map now actually working and there's no longer a weird mostly transparent black overlay on the screen. 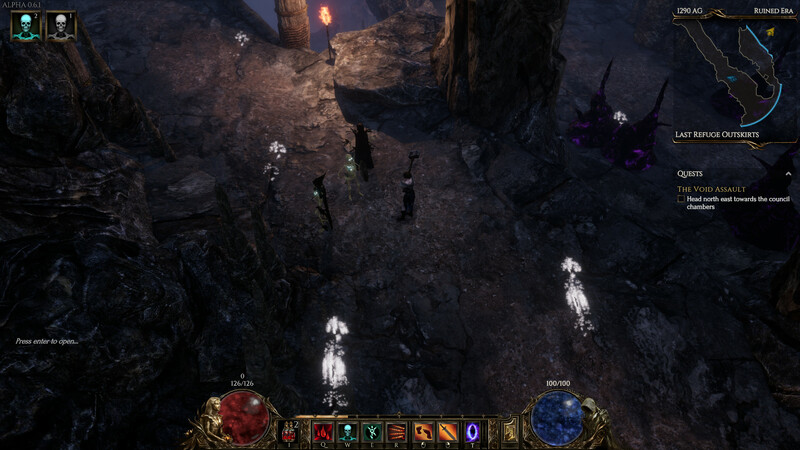 As for major features it now includes gamepad support; a cosmetics system; a reworked potions system, with potions now dropped by enemies you store with a belt item; a companion system; new and reworked character skills including plenty of new passive abilities; level requirements for items; UI improvements; performance improvements to many areas of the game and the list goes on for a while. When I say it's huge, I really do mean it! The full patch notes are pretty long, you can find them here. Quite an unfortunate bug that one, as it makes it quite a mess to look at when there's a lot of it, so I won't be progressing much further through this patch to do any videos or talk more about it until it's solved. I've played a good hour of it though and it's already incredibly fun, especially the Acolyte class as I've been running around raising skeletons and hacking away at all sorts of enemies. If you appreciate games like Diablo, Victor Vran, Torchlight and others you're probably going to enjoy this quite a lot when it's ready for more Linux players. I do hope they improve the update and install system with their launcher though. I had to do a fresh install today, as my original download of the launcher oddly refused to connect. This was a bit painful, as the fresh download took a while but worse was when the launcher was extracting everything it downloaded which honestly took a good half an hour. Still, it's early days I've no doubt that will be improved. You can find out more about it on the official site. For those interested, you can pick up a copy right now here, higher tiers include alpha/beta access. According to the details on their site, the Beta is due to start next month so it might be worth waiting on that for cheaper access. Huh, interesting thought that they might be blood patches, I figured those white patches were light reflection issues. The good news is that they're really only prevalent in the first 6 or so levels. Might also be worth noting for people that may be interested that the Beta is scheduled to start in about a month (with cheaper access). More Diablo-esque games on Linux would be welcome, I think. I loved Torchlight II, and Viktor Vran was good except for not being able to make my own character (still need to go back and finish that). Another good entry to that, hopefully one without the controller weirdness I had on VV, would go down nice. Of course it's blood. They're definetely not the result of a failed aspiration. Wink wink nudge nudge. I had entirely forgotten about this game, which is normal for me. I've had to forget about so many broken Kickstarter promises for Linux releases that it's simply become an automatic response anymore. Still, this sounds like it's well underway, and that's great! I love a good 3D, non-rogue-adjectival-suffix ARPG (note the lack of the letter "J" in there), and there simply needs to be more of them for me to love!